where E is the released energy, m is the mass difference and c is the speed of light. The energy that is released in the decay of a uranium nucleus is about 200 MeV, which corresponds to 4*10-25 grams. This means that the energy release is about one million times higher than what is released when burning a fossil fuel such as gasoline. Under normal circumstances uranium-235 has a very long lifetime. 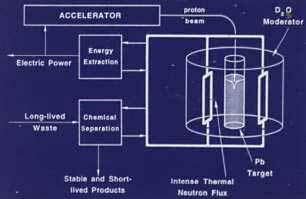 But in so called induced fission it is made to decay by absorbing a neutron. In the decay, several new neutrons are emitted which in turn induce the decay of other uranium nuclei in a chain reaction. In order to control the process one uses a so called moderator which absorbs some of the neutrons and thereby makes it possible to regulate the speed in the chain reaction. Not only are there radioactive substances produced in the decay of the uranium nucleus but there are also other radioactive substances with a very long lifetime that are produced by other mechanisms. One such example is plutonium-239 which has a lifetime of about 24 000 years. The question what to do with this waste is a big problem that has to be solved. At the Department of Radiation Sciences and the Department for Neutron Research at Uppsala University one is conducting a research project which studies the possibilities of converting long-lived waste products into short-lived ones. 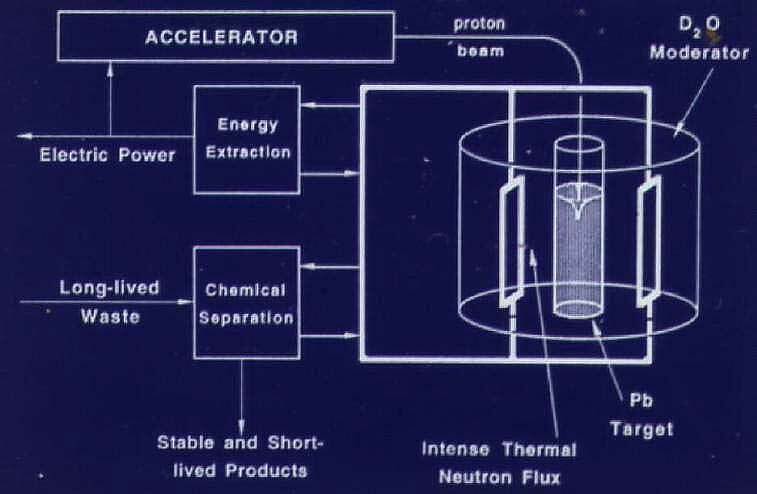 The idea, called ATW (Accelerator driven Transmutation of nuclear Waste), is to irradiate the waste with an intense neutron beam in order to convert the long-lived isotopes into more short-lived or stable ones. Another way of releasing energy stored in nuclei is by fusing light nuclei into heavier ones. This means that one tries to imitate processes in the sun. Research in this field is today done in global collaborations, where among others a group from Uppsala University takes part.